UEFI is nothing new but it is first time introduced in Windows 8. 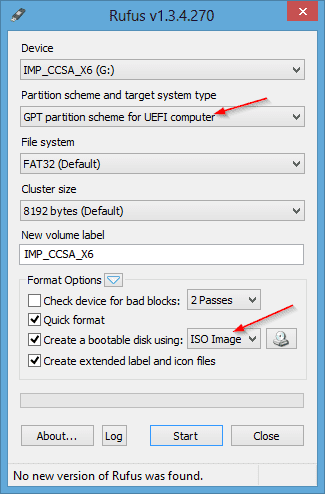 If you want to install a clean copy of Windows 8 or Windows 8.1 on a UEFI enabled computer, you will need a UEFI bootable USB flash drive to start with. This is a tutorial to show you how to make such flash drive with and without the help of 3rd party tool. 1. Connect the USB flash drive to your computer, of course. 5. Now close the Command Prompt window, and open File Explorer, browser through to the location where saves the Windows 8 installation ISO image file. 6. Mount ISO file by right-clicking the ISO file and choosing Mount. If you don’t see Mount command from the context menu, go to Open With → Windows Explorer instead. 7. Select everything in the ISO file, and copy them into the formatted USB flash drive you prepared earlier (Figure 1). 8. One more extra step if you are preparing for a 64-bit version of installation. You will need to copy a file called bootmgfw.efi from inside install.wim file at sources folder to efi\bootfolder on USB flash drive, and rename it to bootx64.efi. Sounds tedious, isn’t it? So let’s put an easy way, you can simply download this file (direct download link) and copy to your efi\boot folder. Rufus, one of the 4 tools we mentioned to build bootable USB flash drive, is a small utility that creates bootable USB flash drive for Windows 7 or 8. What makes Rufus different is that it offers 3 different partition scheme to target the system type, such as those UEFI based computers. You can make a bootable drive that can directly boot off on a UEFI computer without turning the Secure Boot off. It’s free and portable. Before you click Start button, check to make sure the settings are selected to similar like Figure 2. That’s it. Hopefully it will help you out this UEFI mystery.